Treatment options may include non-surgical and surgical treatment. Non-surgical treatment consists of rest, ice, compression, and elevation (RICE protocol); all assist in controlling pain and swelling. Physical therapy may be recommended to improve knee motion and strength. A special knee brace may be needed to help stabilize your knee. Crutches may be recommended to protect your knee and avoid bearing weight on your leg. The donor tendon is allograft tissue. Dr. Patel uses a double bundle reconstruction technique. The first tunnel is created in the femur at the anatomic attachment site of the anterolateral bundle at the anteromedial wall of the intercondylar notch. 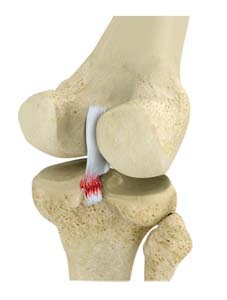 This tunnel is drilled about 6-8 mm from the articular surface of medial femoral condyle. The second tunnel is at the site of the posteromedial bundle. Typically a 1-2mm bone bridge is left between the two tunnels. Patients are advised to maintain the knee in a PCL knee brace post-operatively. Patients should not bear any weight on the operated knee for the first 6 weeks. Pillows or other supports are placed under the tibia, for the first two months after surgery, to prevent any posterior subluxation of the tibia. Physical therapy is started within the first week of surgery.